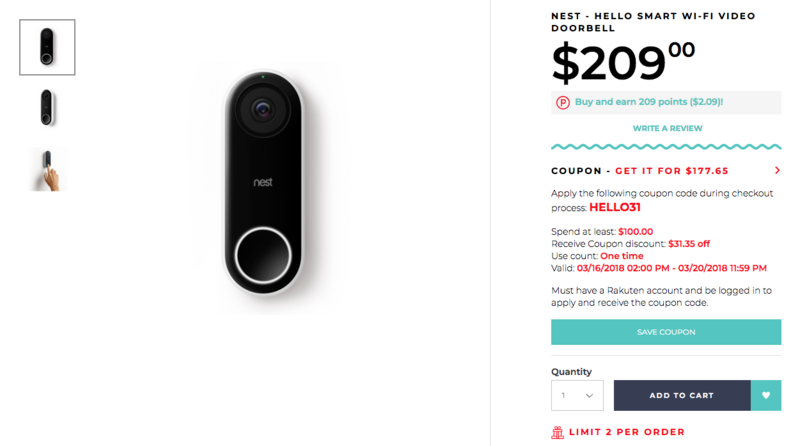 The Nest Hello's only been out for a few days, and it was just added to the Google Store earlier today. But it turns out that a seller on Rakuten has been offering Hello units for just $177.65 a pop, which is surprising to see for a brand-new product. But if you want one, you'd better hurry; there are only five hours left to take advantage of the deal. This new smart doorbell comes with an HD camera, night vision capabilities, and two-way audio. The camera records 4:3 HDR video with its 160-degree wide-angle sensor and streams 24/7, and the 'HD Talk and Listen' audio comes with noise cancellation and echo cancellation. You can also pre-record messages. Use code HELLO31 at checkout to take advantage of this. The discount was actually first made available on March 16th, though it seems like it expired and has just become available again. If you're interested, you'd better hurry; the deal expires at 11:59pm tonight. A time zone isn't listed, but we're guessing it's Pacific Time since that's where Good Guys Electronics (the seller) is headquartered. If that's accurate, there are about 8.5 hours remaining as of publishing time.